All my photographs can be purchased as fine art prints. Small prints can be purchased here, directly on this website. Large prints are available through my online shop at Fine Art America. Both websites use secure online payment systems. I believe in the beauty of the small print and the elegance of the square format. So I’m offering a special selection of small square prints from my portfolios that I believe are perhaps the images people love most. Prints are available for purchase, matted only or framed, on this website. A matted Signature Edition print is made to order as a 3-3/4” x 3-3/4” print, signed and matted in an 8”x10” light gray, beveled, bottom-weighted, acid-free mat. 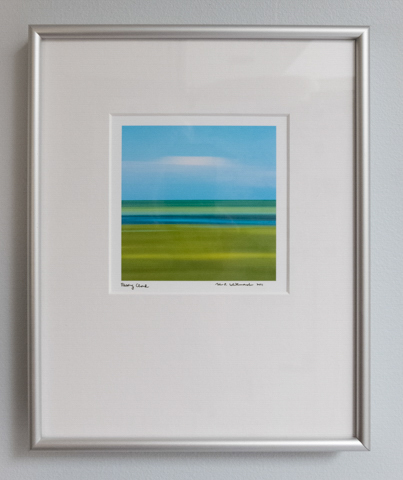 A framed Signature Edition print (shown) is signed, matted and mounted in an 8”x10” Nielsen Frosted Silver round-top metal frame with clear plexiglas, wired and ready to hang. Please note: I currently offer Signature Edition prints only in square format, in only one size and only on this website. 8”x10” matted: $36, including free US shipping via priority mail. International shipping additional. 8”x10” framed: $95, including free US shipping via priority mail. International shipping additional. How to buy: Signature Edition images are found in my “Squares” portfolio. To purchase, please click on the image, select a matted or framed option and use the PayPal shopping cart to check out. You need not have a PayPal account to use the shopping cart. It is simply the service I use to process payments. Major credit cards are also accepted. Alternately, you may contact me by email to place a credit card order. Large prints are available in a wide variety of sizes and formats at my online shop at Fine Art America (www.fineartamerica.com). Here you’ll find more than 100 of my images, including those on this website. They are available as framed, canvas, acrylic, metal and wood prints in sizes up to 60 inches wide and in hundreds of metal and wood frame styles. Open Edition prints are not signed. Fine Art America is the world’s largest art marketplace and professional print-on-demand company. FAA has 15 fulfillment centers located in five countries. Orders can be printed and shipped to any destination in the world within 2-3 business days and delivered ready-to-hang. FAA offers a 30-day money-back guarantee on any product purchased through my online shop. You can buy with confidence.